Four young aspiring chefs are one step closer to making their dreams of attending culinary school a reality after being named finalists in Rachael Ray’s “Cook Your Way to Culinary School” competition. On Tuesday, February 13th, Jules Esposito, an 18-year-old high school senior from Wallingford, CT, will be cooking to win! She has had her sights set on culinary school since the 2nd grade. She started a baking blog in middle school and is part of a culinary program that has allowed her to manage a food truck and cater events. The contest, launched in October 2017, attracted hundreds of submissions from all over the United States. Entrants were required to submit a video showing them preparing an original recipe dish and explaining why they feel they deserve to win the scholarship. 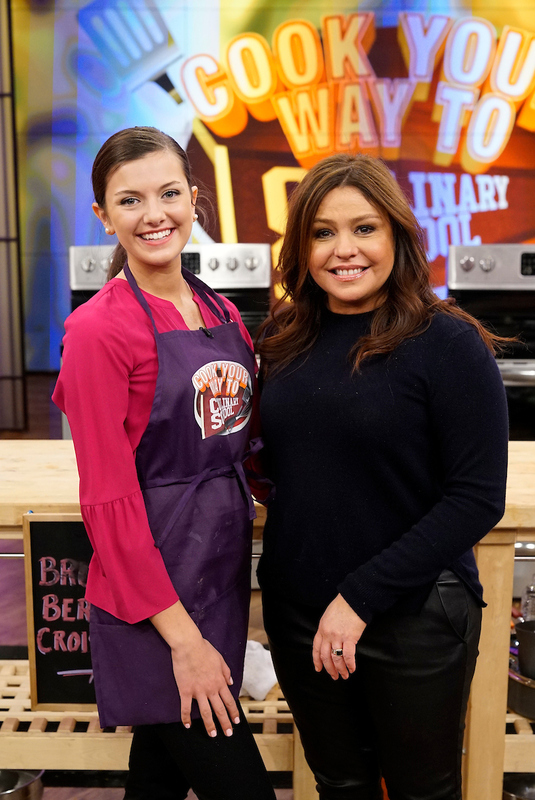 The competition will air on RACHAEL RAY next Friday, February 16, with the winner being announced at the end of the show. Each day next week, leading up to Friday’s show, the contestants will be introduced individually in a segment on RACHAEL RAY. The winner will receive a $25,000 scholarship from Rachael’s “Yum-O!” organization, as well as $500 worth of Rachael’s cookware. The three runners-up will also each win a $5,000 scholarship plus the cookware.